The legendary gospel and soul singer Mavis Staples comes to town thanks to the Halifax Jazz Festival. 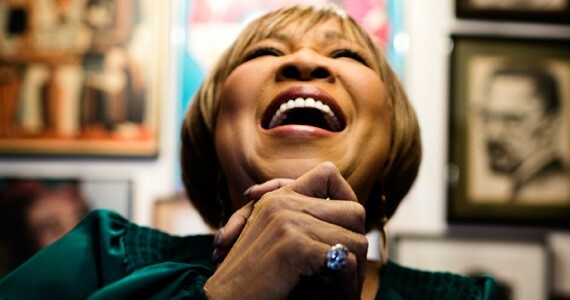 Marvelous Mavis Staples stirs the soul. Mavis Staples is a woman who has sat gracefully at the contentious crossroads of pop culture, politics and religion for the better part of 70 years. Here is a fleeting portrait of her life, as part of the legendary family gospel group The Staple Singers. Formed in Chicago in 1948 at the behest of father Roebuck, a former plantation worker who played in gospel groups through the '30s, The Staple Singers featured sibling singers Cleotha, Yvonne, Pervis and Mavis, with Roebuck on guitar. All the children had learned to sing in church choirs, except for Mavis. The youngest daughter of the Staples family had a voice, even at a young age, considered too low and gravelly to be featured in choirs. As the Staples were garnering national attention thanks to a 1956 hit single, "Uncloudy Day," they would highlight Mavis' uncanny vocals by taking advantage of audiences' assumptions with subtle stage antics. On bandstands across America, the Staples would strike up the familiar song and have Pervis poised centre stage at the microphone, ready to sing. As the time for the lead vocal phrase arrived, 16-year-old Mavis would reveal a microphone of her own and begin to belt it out. Beyond this initial awe, The Staple Singers would go on to inspire ideals of unity, love and devotion at a crucial time in American history. Their rise to fame in the '60s became synonymous with the burgeoning civil rights movements. Roebuck began penning protest anthems whilst befriending Martin Luther King Jr. The group performed these originals alongside contemporary classics such as Bob Dylan's "A Hard Rain's Gonna Fall." Mavis Staples would later court Dylan for the better part of a decade, and ultimately refuse his hand in marriage. And this was only the beginning for Mavis and "God's Greatest Hitmakers": the '60s saw them signed to the illustrious Stax Records, working with Booker T. And The MG's, swinging with Muscle Shoals' legendary Swampers and performing at JFK's inauguration. The Staple Singers had become one of the most successful bands in America and, while one usually reserves the term "uncompromising" for more innovative groups, the Staples' were certainly that in their unwavering commitment to gospel music values and aesthetics. The ensuing decade saw big chart hits for the family, the infusion of disco and funk, collaborations with The Band and Talking Heads' David Byrne, and solo careers for both Roebuck and Mavis. This period was a commercial success for the group, but it wouldn't be until the early aughts that Mavis would reinstate the artistic heights of the Staples family. Beginning in 2004 with Have A Little Faith, Staples has been experiencing something of a renaissance. Her music continues to pay homage to her roots as a religious and civil rights figure, as well as her legacy with her family band, while moving into new territories. Her two most recent efforts, 2010's Grammy-winning You Are Not Alone and 2013's One True Vine, were produced, recorded and performed by Wilco's Jeff Tweedy and features Staples' gloriously ageless vocals amongst a blend of Americana and warm gospel tones. Throughout over 60 years of various struggles, scenes and successes, Staples' reputation for spiritual embodiment and unparalleled performance has remained her calling card. Her impeccable vocal abilities lend to her art the airs of life-affirming joy and sorrow. Her legacy is found in transition—the change from bad to worse, the rise through suffering, a richer understanding of the human condition.